1. The lightbox adopts side-guide lighting design, using newest optic quality acrylic panel, which distributes light evenly. 2. World class 2835 high brightness LED lights as light source, high brightness and low power consumption. 3. LGP is adopted 3D laser engraving technology, which longer life span and distributes lighting evenly. 4.The thickness only 6mm, the frame cover width 50mm, with 20mm transparent side. 5.This item A3 size frame size is 500mmX377mm, the A3 graphics size is 420mmX 297mm 6. 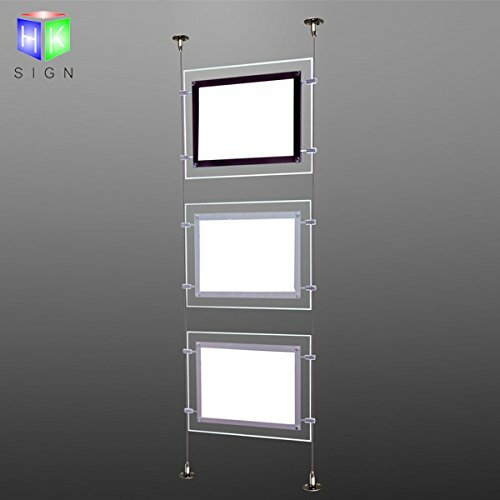 Application interior decoration, chain operation store, company signboard, commercial centre, supermarket, airport, station, subway, bank, bus station, large exhibition project etc 7. standard production hanging way is Horizontal, and the price is include 3pcs A4 single side led light box hanging. 8. the wire ropes is very strong, each cable can hanging more than 25kg , so it can hanging a lot of as you need. 9.every year, our company has attend the international sign fair in Florida or Las Vegas in United States of America. so we are more pay attention the quality when production. If you have any questions about this product by HKSIGN, contact us by completing and submitting the form below. If you are looking for a specif part number, please include it with your message.